Subscribe to Monument's "Off the Wall" Blog! 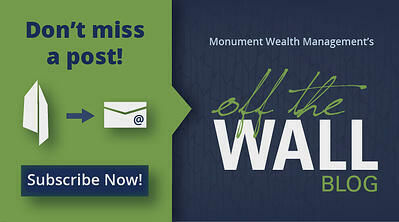 Subscribe to Monument Wealth Management's "Off the Wall" Blog and Market Commentary for weekly email updates on the market and important financial news! All blogs are written by Monument Wealth's award winning financial blogger, David B. Armstrong, CFA. See his video and background on our website for more information. Monument Wealth Management is a Registered Investment Advisor. Copyright 2017. All Rights Reserved.